Every year we share a new holiday ornament for the holidays, This year's holiday ornament is sponsored by Construct a Truck USA. Construct A Truck USA, a Trotec customer, is a unique and creative, family-owned company based in Michigan. Their vision: A smaller kind of car company with a big idea: Let youngsters build their own model truck on an assembly line! 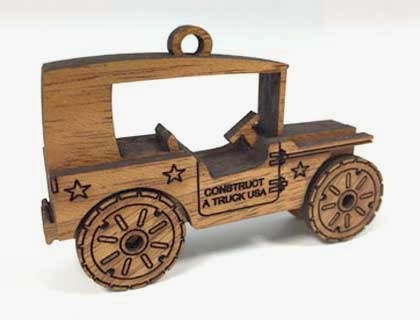 With that spirit in mind, Construct A Truck USA owner Jim Bustamante is sharing downloadable files of a miniature truck ornament that will enjoyed on Christmas trees across the world for years to come.